Newport Beach, Calif. — Receiving a notification from the IRS that your estate tax return is under audit can be disconcerting to say the least. The prospect of additional estate taxes, legal fees and the delay to closing out an estate should be on the minds of any trustee or fiduciary when preparing their return and getting appraisals for antiques, rare art, coins or antiques. The IRS filing, often referred to a 706 filing for the IRS Form 706 used to describe all of the tangible personal property of an estate is a bit daunting. Trustees should use the services of a qualified tax attorney to prepare this form to avoid triggering an IRS audit. One of the most common issues that can trigger an audit of your IRS 706 filing is a deficient appraisal. The IRS will be looking for an appraisal that lacks several standard components pertaining to methodology for valuation and current comparable values that support a value conclusion. Appraisals by their very nature are subjective and thus are prone to interpretation and are often overly favorable for the taxpayer. The IRS closely scrutinizes appraisals and has the ability to hire its own appraisers or use its own in-house appraisers to provide a different valuation—one that is likely to be less favorable to the taxpayer. Consequently, submitting an appraisal that will withstand the closest scrutiny is strongly suggested to avoid triggering an audit. First, the appraisal should be as specific as possible to the methodology used for the particular asset to be valued. An appraisal should avoid standard boilerplate language or where the appraisal appears repetitious. The IRS is familiar with the report formats and boilerplates used and can easily distinguish between generalized statements and actual statements relative to the item being valued. The appraisal should be easy to understand and, more importantly, your tax practitioner should fully understand it and be prepared to answer any question that the IRS may raise with respect to its details. The practitioner should be able to communicate in clear and simple terms the methodology, analysis, and conclusions of the appraisal. If he is unable to explain clearly the specifics of the appraisal, this could give the appearance that he does not trust the appraisal or worse, that he is incompetent. Appraisals that are straightforward, use recent examples of similar items sold, and provide details on condition and quality are preferred. An appraisal should also discuss the different methodologies that are available to perform the appraisal and, where appropriate, explain why the chosen method is more appropriate than others. This approach demonstrates a more thorough report and will more likely be given a pass by the IRS. One concern is the situation where an appraiser values the asset using different methods and purposely leaves out the less favorable one. Another is the appraiser uses one methodology to value one piece of art and a completely different to value another piece of art. However, trustees and their tax attorneys sometimes unwittingly do this themselves when they rely on old appraisals for some items while getting fresh appraisals for others. Best bet is to get everything appraised by the same appraiser or at least ensure methodologies used are consistent. In the end, the IRS is looking at whether or not your 706 Filing has been made with all due diligence to set a "Fair Market Value" for each item. Fair market value is defined by the IRS as "the price that property would sell for on the open market. It is the price that would be agreed on between a willing buyer and a willing seller, with neither being required to act, and both having reasonable knowledge of the relevant facts." Expert appraisals are suggested for tangible property, such as works of art, jewelry, precious metals, or coin and stamp collections. 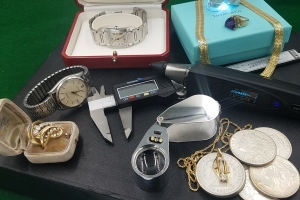 The IRS requires a professional appraisal if any one item is valued at more than $3,000, or any collection of items is valued at more than $10,000. If your estate will be large enough to trigger federal estate tax, you should obtain advice from an experienced estate-planning professional who can help you sort through your options. There are a number of estate-planning tools you can use to reduce estate-tax liability. If you would like to speak to an appraiser regarding a work of art, rare antiques, coins or jewelry, please contact GoodLife at +1 866 294 0150.